Is America's Spy Plane Back — and Hypersonic? The hypersonic spy plane, dubbed SR-72, might already be in production. The SR-71 Blackbird spy plane may be back and faster than ever. Or maybe not. 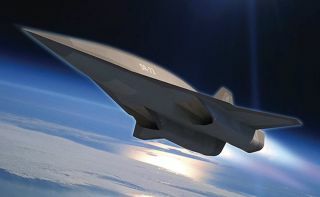 Ambiguous wording at an aerospace-conference presentation last week suggested that the SR-72, a successor to the infamous Cold War spy plane, might already be in production, but neither the military nor the plane's possible maker, Lockheed Martin Corp., is talking. The wording implies that the aircraft has, in fact, been made, as does O'Banion's later comments, also in the present tense. "We couldn't have made the engine itself — it would have melted down into slag if we had tried to produce it five years ago," O'Banion said, according to Bloomberg. "But now, we can digitally print that engine with an incredibly sophisticated cooling system integral into the material of the engine itself, and have that engine survive for multiple firings for routine operation." Both the U.S. Air Force and Lockheed Martin declined to confirm the existence of a real hypersonic (more than 5 times the speed of sound) spy plane to Bloomberg. Outside defense experts told the news outlet that the plane could be anywhere in the development process, from the digital design phase to the prototype phase. The SR-71 Blackbird was a speedy, stealthy spy plane specifically designed to absorb, rather than reflect, radar signals and, hence, remain relatively hidden. Though it's more than 107 feet (33 meters) long, the plane appeared on radar as an object somewhere between the size of a bird and a human, according to Lockheed Martin's history of the plane. The Blackbird was made from titanium so that it would have the strength to withstand the heat generated while flying at above Mach 3 (2,045 mph or 3,300 km/h), or three times the speed of sound. Developers painted the plane black to dissipate some of the heat, lending the aircraft its "Blackbird" moniker, according to Lockheed Martin. The two-seat SR-71 first flew on Dec. 22, 1964. It was retired in 1990, retaining the record of fastest manned aircraft ever made. According to the Smithsonian Air and Space Museum, the final flight of the Blackbird now displayed at its hangar in Chantilly, Virginia, set a speed record: The plane flew from Los Angeles to Washington, D.C., in 64 minutes and 20 seconds. Lockheed Martin's interest in developing hypersonic "scramjets" — which use oxygen from the environment rather than a tank for combustion in the engine — is no secret, according to Bloomberg. However, the engineering challenges are steep. Secrecy and rumors are the norm in the development of new stealth aircraft. According to a Central Intelligence Agency history of the development of the SR-71, the government tried very hard to keep the development of the original Blackbird classified, but a former U.S. Navy admiral named John B. Pearson said he figured out that Lockheed was up to something by 1961, just three years after the project started. A newspaper in Fort Worth, Texas, also reported the possibility of a new faster-than-sound airplane in 1963. Editor's Note: This article was updated to indicate that the SR-71 was not hypersonic, but instead could fly at three times the speed of sound.